All transactions are safe and secure with a reliable history in online purchasing behind each of our associates. Buy the How I Met Your Mother MacLaren's Bar t-shirt to own How I Met Your Mother clothing and merchandise. In order to describe the design on this tee, we must turn to the Barney Stinson quote from How I Met Your Mother, "It's Legen... wait for it... Dary." Ted, Barney, Lily, Marshall and Robin love to hang out at MacLaren's Bar. They are the Cheers gang for our generation. 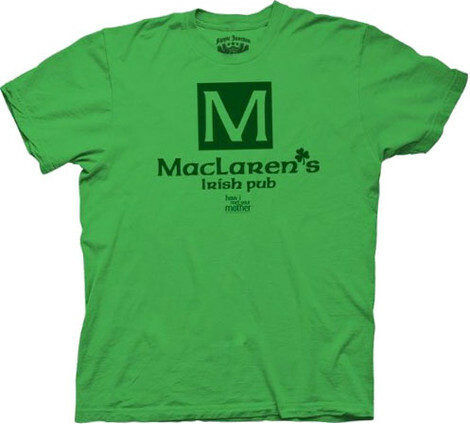 These awesome MacLaren's How I Met Your Mother t-shirts feature a logo on the front that reads, "MacLaren's Irish Pub". See the design on hoodies, jerseys, and tank tops. In addition to the How I Met Your Mother MacLaren's Bar tee above, browse the How I Met Your Mother Clothing Gallery for more apparel like men's and women's clothes, kids shirts or hoodies.